Welcome back!! I hope you are relaxed, rejuvenated, and only a couple pounds heavier than you were pre-Christmas. :) Hope you had an amazing time - I know I did! My family rocks. We had the best time! This may have been the best Christmas ever! And the best part? Logan turned three! My big boy. :) I've got a letter to him for his 3rd birthday coming up this weekend. So this three on thursday is dedicated to my three year old! I didn't make him any presents for Christmas or his birthday (bad crafty mommy!). But I figured his quilt is almost done and will be done by my birthday (wrote that so I'd have to follow through). But here are a couple things I'd like to give my son this year while he is three. Two are handmade, other, well, just read on. 1. 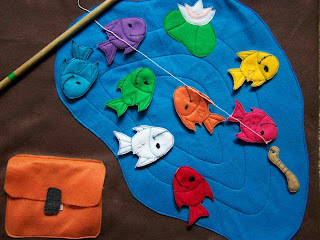 This felt fishing game looks so cool. I know he'd get the biggest kick out of it! And it would prep him for his inevitable future of fishing with Daddy. :) The tutorial is from a guest post over at Holy Craft. 2. I'm bound and determined to make him one of these crayon rolls (tutorial here by Life in Grace). I know I've been saying it for a year, but this year will be the year! 3. What better gift to give your little one than a happy mommy? 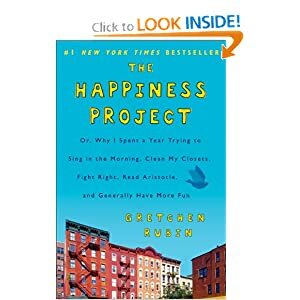 I got the book The Happiness Project from my sister and don't know why I didn't buy it sooner. I read almost the entire book on our trip back from South Dakota this week and am determined to start my own happiness project. Month 1 is dedicated to declutter. My biggest source of unhappiness is stress. My biggest source of stress is clutter - physical, digital, time clutter, etc. So I'm going to streamline in January. I believe getting that one out of the way early will give me the right mindset to move forward. Find out more about it on the Happiness Project blog. And look for my resolutions and action item updates to be posted here. And buy the book!